TEG's Valuation Partner, Mike Wolfe, CPA/ABV, CVA, spoke on the Demystifying Financial Statements panel alongside Matt Hancock, Praxis Consulting Group and June Firestone, Crescent Industries, Inc. During this interactive session, the panelists helped participants understand basic financial statements and connect how their work affects the company’s finances and how that is eventually reflected in the share price. The ESOP Association is America’s largest employee-sponsored advocacy and education association focused on employee stock ownership plans. The Association seeks to enhance federal laws governing ESOPs, provide members with expert information, and fund research via the Employee Ownership Foundation. 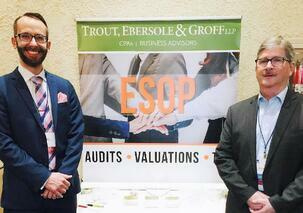 The ESOP Association is a national non-profit organization with 18 local Chapters. Its members include ESOP companies, companies considering an ESOP, and service providers that assist in setting up and maintaining ESOPs.